At Perennia Landscaping, we work closely with and listen to the needs and desires of our clients, and using the best plants available, we design a garden that will enhance their property and provide enjoyment for years to come. All of our work is supervised by our owner, Julian Charnis, a horticulturist and arborist with more than 38 years experience. We pride ourselves on our prompt service and attention to detail. Call us today at 914.962.2673 for a professional consultation. Our landscape design company has been serving the Northern Westchester area, including the towns of Briarcliff Manor, Ossining, Croton-on Hudson, Cortlandt Manor, Yorktown Heights, Bedford, Mt. Kisco, Chappaqua, Pleasantville and Armonk for over 38 years. We design and install highly deer-resistant gardens using evergreen and deciduous shrubs, and perennial plantings. 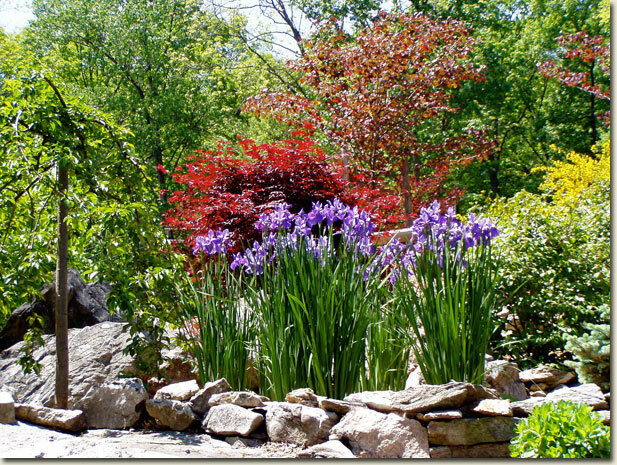 Our goal is to create colorful and iteresting gardens that have appeal all year long, with minimal maintenance. By choosing the right selection of plant materials for your landscape project, you can have a variety of colors and textures of flowers and foliage, using evergreens, deciduous shrubs, bulbs and perennials. Evergreens can be used that are blue, aqua, yellow, spring or forest green. Deciduous shrubs and perennials can be selected for flowering during the summer and fall after evergreens have finished flowering, and for their outstanding fall color. Bulbs can be used for early spring color. A large variety of plant species should be used to maximize these goals. These gardens can be created using highly deer-resistant plants, making deer netting and spraying unnecessary. Long term planning is key to a successful landscape planting project. Unfortunately, landscape designers, both amateur and professional, fail to plan for what their design will look like five, ten, and even fifteen years later. The design should include nicely shaped planting beds that have ample room for growth. The plants should compliment rather than crowd each other. Conditions such as light exposure, drainage, and use of the most beneficial soil amendments must be taken into account. Certain plants can be used for specific purposes such as dealing with a problem hillside, or creating an aesthetic barrier. You can minimize your lawn by using perennial ground covers and creating new planting beds. By working closely with and listening to the needs and desires of our clients, using only the best plants available, we design, install and guarantee our plantings to our customers' complete satisfaction.